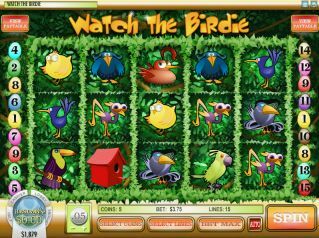 Watch the Birdie fly and collect those bonuses in this 5 reel, 15 line video slot filled with birdies. Coin denominations are: $0.01, $0.05, $0.10, $0.25, and $0.50. You can bet up to 5 coins per line. Hit 5 jackpot birdie houses on an activated pay-line and collect 1,500 times your line-bet. The game has an expanding wild (Bird Egg) which means the wild symbol will expand to the entire reel, increasing your chances of a winning combination. The Bonus Birdwatcher is the scatter symbol. Three Bonus Birdwatcher symbols scattered on the reels will activate the bonus round. In the Find the Birds Bonus Round you must choose the egg which you think contains the bird at the top of the screen. If the bird matches you will be awarded a win. You can pick 5 birds. Some eggs contain a "Bonus Bird of Happiness" which will fly through the screen to re-lay all eggs. You will then, keeping the coins you have won so far, have a chance to find each of the birds again in the new set of eggs. You might find the "Bonus Bird of Happiness" more than once, and the round will continue until you have a chance to find each of the five birds, or don't find the Bonus Bird on any of your attempts.